Good and sharp Tennantite crystal faces, good disposition on the white Quartz matrix. As frequent in Oliete's specimens: a good esthetic choice. 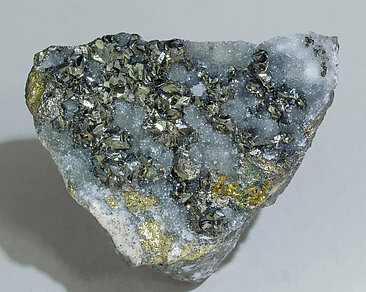 Minor Pyrite is also present. 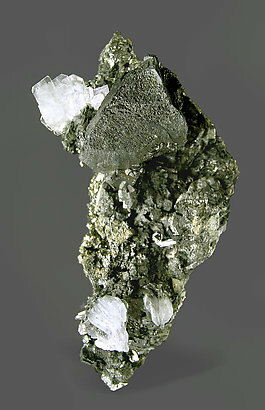 A curious crystal partially deformed with predominant faces of the tetrahedron, enhanced on a matrix of small crystals of Tennantite, Pyrite and laminar crystals of white Baryte. 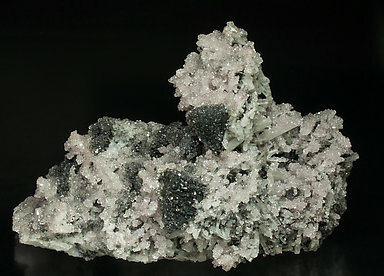 Crystals of Tennantite, of very good quality, implanted on a group of white Quartz crystals. The Tennantite crystals have good size, are bright and rich in faces. 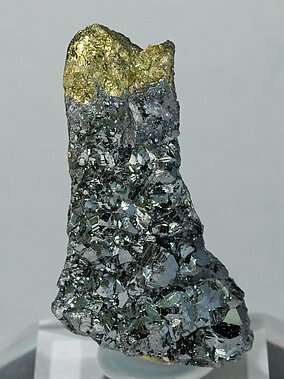 Predominating are the faces of the tetrahedron, some of which have hollow growths occupied by small twinned crystals of Chalcopyrite. 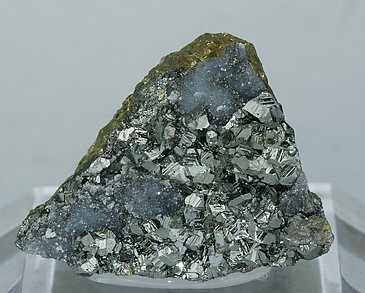 Group, on a Chalcopyrite matrix, of complex Tennantite crystals with a tetrahedral shape and very rich with faces, very bright and partially coated by small Quartz crystals. 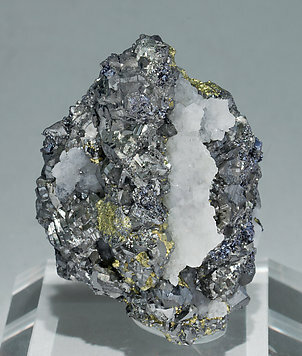 The analysis of the crystals indicates that they are basically silvery Tennantite, but the presence of other silver minerals such as Miargyrite, Pyrargyrite or Freibergite has been detected. The sample is from a Mexican zone that is scarcely known in mineralogical circles, so we indicate the locality as approximate because we don’t know if all the samples are from a single mine, different mines, or from a wider mining area. We will send a copy of the analysis of the Tennantite to the buyer. 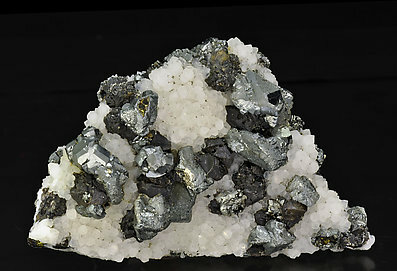 Group, on a Chalcopyrite matrix, of complex Tennantite crystals with a tetrahedral shape and very rich with faces, very bright and partially coated by small Quartz crystals. 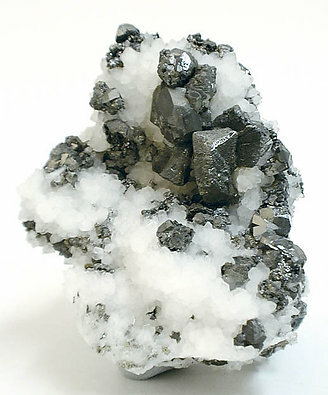 The analysis of the crystals indicates that they are basically silvery Tennantite, but the presence of other silver minerals such as Miargyrite, Pyrargyrite or Freibergite has been detected. The sample is form a Mexican zone that is scarcely known in mineralogical circles, so we indicate the locality as approximate because we don’t know if all the samples are from a single mine, different mines, or from a wider mining area. We will send a copy of the analysis of the Tennantite to the buyer. 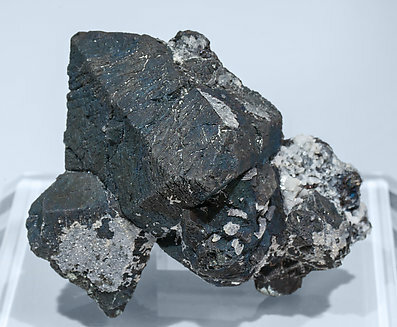 Black tetrahedral Tennantite crystals with very well defined faces and edges. They are on matrix, with Quartz crystals and small, very bright, Smithsonite crystals that partially coat both Quartz and Tennantite. 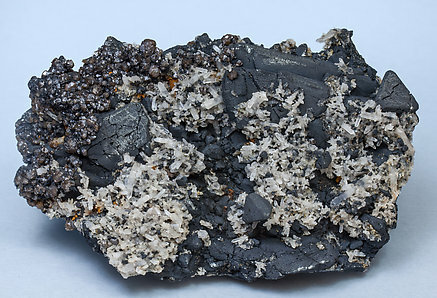 Group of tetrahedral Tennantite crystals that are beveled by other minor forms, with very well defined faces and edges and partially coated by small white Quartz crystals and groups of small Wulfenite crystals that are very rich in forms and with a dark reddish–brown color.